Most importantly, remember that severe vaccination reactions are rare. That's why it was difficult to find a decent picture - sorry for the quality of this one. True hypersensitivity or anaphylactic reactions to vaccines, while rare, do occur and require immediate attention. The physiology behind these reactions is very complex and poorly understood in horses. Anaphylaxis refers to a shock reaction by the body to some foreign substance. In the case of vaccines, anaphylaxis can occur the first time a vaccine is administered. An anaphylactic response can vary from mild hives that appear hours after a vaccine is given, to acute life-threatening cardiovascular collapse which can occur within minutes of vaccination. Epinephrine is the preferrred initial treatment for severe anaphylasis. It works by counteracting the immediately life-threatening components of the body's severe inflammatory response. It is usually administered by intramuscular injection. In the most severe cases, it may be given intravenously. Administration may be repeated every 15-20 minutes if necessary. Hypersensitivity and immune-mediated reactions to vaccines also occur and may have similar clinical signs to anaphylaxis. When these reactions occur, they usually are less dramatic than acute, severe anaphylaxis. Signs may include swelling of the muzzle, face and throat region, which can lead to respiratory distress, or may manifest as hives, or urticaria. Depending on the severity and progression of the clinical signs, treatment may include steroidal or non-steroidal (phenylbutazone, flunixin/banamine) anti-inflammtory agents, and/or anti-histamines. When a horse experiences an adverse reaction to vaccination, the question always arises, should the horse be vaccinated again? If the reaction is a very sore neck, sometimes changing vaccine brands, and thus the adjuvant used, will help. If the horse has a true anaphylactic or severe hypersensitivity response to vaccination, the problem is more complex and the decision to repeat vaccination should be made based on the severity of the reaction and consideration of the true risk of the disease against which vaccination is directed. Finally, for those of you who adminster your own vaccines, be aware that storage conditions are extremely important for vaccines. Vaccines that are not stored at proper temperatures are significantly more likely to cause adverse reactions than those kept cool at all times. Also, correct administration of intramuscular shots, both with respect to location of the injection and injection technique, play important roles in the safety of injections. If you choose to vaccinate your own horses, be sure to obtain instruction from a licensed veterinarian or licensed veterinary technician concerning the correct administration of intramuscular injections. And be sure that your vaccines have been properly stored before you purchase them, check the expiration date, and keep them carefully stored until they are administered. Better yet, take advantage of the chance to visit with your vet and have a spring wellness check up and make an appointment with your veterinarian to give your spring vaccinations! It's cold and snowy on March 31 in Northern Nevada. What's it like where you are? Looking forward to spring and good riding weather. Vaccination season is drawing to a close, but I thought I would return to this subject one more time to talk about vaccination reactions. Of course I would like to tell you that I have never had a horse demonstrate an adverse response to vaccination, but that would be a big fat lie. Fortunately, I can tell you that I have never had a horse suffer a serious vaccination reaction that didn't respond promptly to appropriate treatment. There are several types of adverse reactions to vaccination, and it is important that you understand how they differ, both in onset of signs, and seriousness of consequences. By far the most common adverse reaction to vaccination is the simple sore neck. I vaccinate hundreds (literally) of horses every spring, and this year to date I know of only two horses which developed significant signs of neck pain following vaccination. Typically the day after vaccination the owner notices that these horses are unwilling to move their heads, show signs of pain if one of the vaccination sites is touched, and exhibit swelling at the vaccination site. Occasionally the discomfort will be so severe that horses will not lower their heads to eat or drink, or will pull back if pressure is applied to a lead rope when they are haltered. Years ago I had a client call to tell me that her horse was having a seizure when in fact the horse's neck was so painful that when the owner tried to lead her forward she reared over backwards in response to the pain. The vast majority of inflammatory reactions after vaccination resolve within 48 - 72 hours with palliative therapy including warm compresses and phenylbutazone. This "sore neck" reaction to vaccination is NOT an allergic response to the vaccine. It is an exagerrated inflammatory response to the ingredient in the vaccine that stimulates the horse's immune system. This ingredient is called an adjuvant, and is very important in causing vaccines to elicit a strong antibody response by your horse's immune system. Without this response, the vaccine will not be effective in preventing the disease against which it is directed. Drug companies spend a lot of time and money developing different adjuvants. Their goal is to find an adjuvant that is a potent stimulator of the immune system but does not cause severe local soreness. Over the years I have used many brands of vaccines, and have come to be a staunch supporter of Intervet vaccines. I believe that their adjuvant causes very few advers reactions, and I have been impressed with the company's dedication to client education and with their committment to research and development of new products to protect horses' health, such as Prevenile, their DNA based West Nile vaccine. When a horse develops a sore neck after vaccination, it is important to notice whether or not the horse is systemically ill. Specifically, will the horse refuse food and water even when it is placed so that the horse can reach it without lowering its head? Is the horse's temperature over 102.5 degrees? Is the swelling at the vaccination site severe and increasing over time? When the swelling is palpated, is there a crackling feeling underneath the skin? Does the horse appear markedly depressed? If the answer to any of these questions is yes, then the horse should be examined by a veterinarian. As stated earlier, the vast majority of inflammatory reactions after vaccination are not serious and resolve within 48 - 72 hours with palliative therapy including warm compresses and phenylbutazone. However, in rare cases, it is possible for a bacteria called Clostridium to grow deep in muscle tissue at a vaccination site. If this unlikely event does occur, it can be life-threatening. Clostridial bacteria exist normally in the environment in a spore form which can only grow in the abscence of oxygen. Even when a clean needle and syringe are used and the vaccination is administered correctly, it is possible for Clostridial spore sitting on the skin to be carried deep into the muscle tissue by the needle during vaccination. When this happens it is a random, extremely unlucky event, and does not mean that the vaccine was administered improperly. Clostridial infections can be life threatening and require prompt and aggressive treatment. The Clostridium bacteria grow rapidly in the abscence of oxygen and produce several toxins which invade the horse's blood stream and cause severe systemic illness which can be fatal. Therefore, it is always a good idea to contact your veterinarian if your horse has an adverse reaction to a vaccine and discuss your horse's specific clinical signs so that you and your vet can decide if your horse needs to be examined. If you take your horse's temperature and do a physical examination (see blog on this!) and carefully observe your horse's behavior before you call your vet you will be best able to provide important information in making that decision. In tomorrow's Vet tip of the Day I will discuss Allergic reactions to vaccination and the importance of careful storage and administration of vaccines, for those of you who vaccinate your own horses. An eight-year-old horse that received excellent care in Germany was purchased by a person in the United States. He was vaccinated and dewormed regularly, and received appropriate booster vaccinations three weeks before his transport by air to New York. Upon arrival he was quarantined according to federal regulations. Once released from quarantine, he was transported by truck to Kentucky with one group of horses, and then shipped on to Florida with a different group. When he arrived in Florida 10 days after leaving New York, a handler noticed he seemed depressed and unsteady on his feet. The owner was alerted and a veterinarian was contacted to evaluate the horse. How and why did the horse become ill? We know the horse received excellent management with booster vaccinations for appropriate infectious diseases three weeks before shipping overseas. The immune system takes at least 10 days to fully respond to a booster vaccine, so ideally they should be given two to four weeks before shipping or change of environment. It would have been advisable to rest the horse in New York following the flight and quarantine before transporting to Florida, and to avoid the mixing of different groups of horses during travel. Research has shown that horses subjected to long-distance transport are at significantly greater risk of infection with respiratory tract pathogens compared to similar non-transported horses. The veterinarian exam revealed the horse had a 102.5 ºF fever and neurologic signs manifested as weakness and incoordination of the hind limbs, and a rectal palpation determined the horse’s bladder was distended with urine. The owner was told that a neurologic form of EHV-1 was suspected and immediate isolation was recommended until a diagnosis could be confirmed because a new, highly contagious form of this disease had been reported in other U.S. locations. Equine Herpes Virus Type-1 (EHV-1) is an old and common disease in horses, most commonly causing an upper respiratory infection in young horses, but also responsible for late term abortion and a sporadic neurologic disease. Luckily, this veterinarian was aware of outbreaks in recent years of neurologic disease affecting multiple horses caused by EHV-1; most notably one in a university hospital in which 46 of 135 in-house patients developed neurologic signs, leading to death in 12 of those horses. It was discovered that the EHV-1 virus had undergone a mutation in which a single element in the viral DNA code was altered. The resulting strain was more virulent, contagious, and specifically attacked the horse’s neurologic system. Therefore it was named neuropathogenic EHV-1. With the emergence of this mutated virus, the clinical form of EHV-1 associated with neurologic signs was becoming more common and more. This exemplifies how a tiny change in the genetic code of a virus can have far-reaching and dangerous effects. In Florida, a nasal swab confirmed the diagnosis of neuropathogenic EHV-1. This first horse was treated and recovered. Meanwhile, another horse off-loaded from the original truck in Kentucky was arriving in Southern California, and a third horse that had accompanied our horse by van to Florida was taken to a farm, and later to a horse show facility nearby. The horse in California walked off the truck with clinical signs similar to the first index horse in Florida, and was quickly assessed and isolated. The third horse never showed signs of illness, but 10 days after arriving at the show grounds, other horses began to develop signs of neurologic disease. Subsequently, the presence of the neuropathogenic form of EHV-1 was confirmed, leading to an extended quarantine of the show grounds. No other cases were detected in Southern California after isolation of the index case, but within the month, a horse was confirmed infected at Golden Gate Race Track. There have been isolated confirmations of neuropathogenic EHV-1 in California horses since, but no multiple case outbreaks have occurred. How could the spread to the show grounds have been prevented? First, when a contagious disease is suspected, the affected horse should be isolated and other in-contact horses should be quarantined and monitored for signs of disease for an appropriate duration. This would have meant immediately contacting the shipping company and identifying all the horses transported with the original horse in Florida with clinical signs. In the case of EHV-1, the incubation period is typically two to eight days, but can be as short as 24 hours – showing how quickly this becomes a logistical nightmare, and how critical every hour becomes. The horse in Southern California was traced back to the horse in Florida, which was connected to the air transport from Europe – tedious tracking, but important to successfully contain infectious diseases. Second, rapid diagnosis is critical. Our astute veterinarian in Florida submitted the nasal swab for a state-of-the-art diagnostic technique called PCR (polymerase chain reaction). This test amplifies specific DNA segments in the sample and allows the detection and identification of minute amounts of viral DNA, confirming that this particular viral strain was present in the affected horse. Finally, how can you as a horse owner reduce the spread of infectious disease? Your first goal is to protect your horse against infection by consulting with your veterinarian to ensure that your horse is appropriately vaccinated. Learn all you can about the safe and comfortable transporting of horses. With these good management techniques, you’re supporting your horse’s immune system and reducing the odds that he will succumb to an infectious disease, even in the face of exposure. Use common sense during competitive events: do not share water, tack, or grooming equipment. EHV-1 is spread primarily by horse to horse contact and by virus transported on equipment and the clothing, hands, and shoes of people moving between horses. If your horse is exposed to fewer viral particles and has a healthy immune system, illness is less likely. When your horse is at high risk of contracting an infectious disease such as EHV-1, even the best management may not protect him completely. If he does become infected with a contagious disease, your goal is to protect him and other horses with early detection. Fever is the earliest sign of most viral diseases. The single most important thing you can do is to monitor your horse’s rectal temperature twice daily at shows, before and after shipping, and when new horses come on the property. Whenever your horse’s rectal temperature is 102.2 ºF or higher, contact your veterinarian and follow their recommendations. 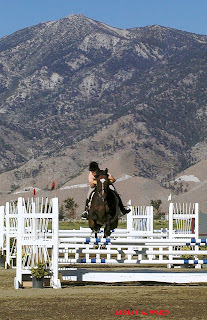 Don’t abandon your equestrian activities for fear of infectious disease. Just stay informed and use common sense to guide you. Your veterinarian is your best resource for advice on the prevention and control of infectious diseases. Don’t hesitate to ask questions and continue your life-long education as a responsible and caring horse owner. This story first appeared in Petfolio magazine, published in Reno, Nevada. I performed a prepurchase examination for a new horse owner this week. She had lots of good questions about her horse husbandry. One thing she was interested in was learning normal physical examination findings, so I thought I would go over some basics which all horse owners should know. In case of emergency, or if your horse simply isn't feeling well, being able to do a basic asssessment of your horse's physical parameters can be extremely useful. Not only does it give you factual information to convey to your veterinarian over the telephone, it also gives YOU factual information to allow you to determine just how serious your horse's condition may be. First you need some equipment. Go to any nursing supply store and by a CHEAP stethoscope. The most basic model is perfectly adequate for obtaining a heart rate. To listen to your horse's heart, place the flat side of the stethoscope bell against your horse's chest just behind the point of the elbow, then push the stethoscope head forward as far as you can so it slides in underneath the triceps muscle. Close your eyes and listen carefully. The heart beat has two parts - lubdub...lubdub...lubdub. Practice until you can hear it clearly. Next go to the drug store and buy a regular old human digital thermometer - I prefer the non-flexible ones. Finally, purchase a small, LED flashlight and cheap watch with a second hand and store them, along with your stethoscope, thermometer, and a small notebook with a pen attached to it by a piece of string in a handy place in your feed or tack room or horse trailer. Here are some normal numbers - write them down in your notebook so in an emergency you don't have to remember them. Heart rate: 28- 44 beats per minute. I usually count the heart rate for 15 seconds and multiply by 4 to get beats/minute. Heart rates over 52 beats per minute are definitely abnormal. Heart rates over 80 beats per minute indicate severe cardiovascular distress. Remember, exercise, nervousness or excitement may cause your horse's heart rate to be elevated without any serious illness present. Respiratory rate: 8-16 breaths per minute. The best way to count the respiratory rate is to stand back from the horse and watch the abdomen just behind the ribcage. In a normal horse you will see a gentle rise of the abdomen with each breath. Taking an accurate resting respiratory rate in a normal horse can be difficult, because as soon as you approach them they begin sniffing and snuffling, thereby disrupting the quiet, resting breathing rate. If your horse has a wide flare to the nostrils with each breath and an deep movement of the abdomen with each breath coinciding with the nostril flare, this is a sign of labored breathing and is abnormal. Gut Sounds: Using your stethoscope, listen to your horse's abdomen in 4 places - up high and down low on each side, behind the ribs and in front of the hip. Gut sounds vary tremendously even in a normal horse, but if you listen for 30 seconds in each location, you should hear at least one good, rumbling gurgle in each of your 4 listening zones. Mucous membranes: Standing beside your horse's head (not in front), lift your horse's lip just enough to see the gums above the incisors on one side. Normal gums are quite pale pink, with a glistening surface. If you press against the gums firmly with your finger for a few seconds, when you remove your finger the gums should be white, and should refill with the normal pale pink color in less than 2 seconds. This is called the capillary refill time (crt). Attitude: When I record my physical examination findings, I will often note: BAR. This is code for Bright, Alert, and Responsive. When you do your physical exam, note your horse's attitude, expression, head position and body position. Look in the stall or pen and check for fresh manure, or signs of distress such as areas where your horse may have been pawing or rolling. Check to see if the water trough is full and if the last feeding has been consumed. Gait/Posture: Finally, move your horse around a bit and check for lameness and willingness to move forward. Now you are prepared to do a comprehensive physical examination on your horse. The best way to recognize abnormal is to know normal, so practice performing physical examinations on your horse frequently so that when you are concerned that something isn't right, you will be confident in your assessment. Wow, the sun came out and I wasn't wearing 4 layers today. It was such a wonderful feeling not to feel that chill in my bones. With spring come those freeze thaw cycles when the ground is frozen in sharp, uneven layers at night only to thaw and turn into a slippery slimey mess during the day. For many of us our horse's turn out areas are a mess this time of year. Particularly around feeders and water troughs, footing tends to be wet during the day and frozen at night. Because our soil is usually so dry, our horse's feet are adapted to a dry environment. After a long wet winter as we've had this year, the manure and urine soaked into high traffic areas where horses stand a lot, combined with the freeze/thaw cycles, create a bad formula for our horses feet. This time of year I see LOTS of severe subsolar abscesses, particularly in older horses. Here's what happens: first, the horse living in a dry desert climate typically has a hard, somewhat brittle sole. Over the winter, if the horse's environment is not kept clean and dry, then wet, manure packed material accumulates in the sole and along the sulci of the frog. This material is full of bacteria. It softens the frog which becomes recessed, thereby leaving the sole in direct contact with the ground. The horse steps on a frozen jagged mud edge, creating a tiny defect in the sole which provides access for bacteria to infiltrate into the foot. The bacteria become trapped beneath the hard sole where there is no air supply. They begin to proliferate, spreading between the natural layers of the sole. In response to the bacterial proliferation, the body mounts an inflammatory response, resulting in the accumulation of pus. Eventually this pus produces enough pressure within the hoof that the horse becomes acutely severely lame. At this point the sole must be removed to allow drainage of the dead tissue and expose the area to air. In the worst case scenario, it is possible for the bacteria to migrate far enough into the hoof to cause infection of the coffin bone, although this is NOT the typical outcome. Once the dead sole is removed exposing the area where the bacteria have infiltrated, with appropriate treatment the sole will harden and repair itself without long term complications. However, subsolar abscesses are extremely painful, and can be frustrating and time consuming to treat, especially in horses living in outdoor settings. Prevention is worth a pound of cure, and subsolar abscesses that occur secondary to poor footing conditions during the winter are preventable. First, be sure your horse has regular farrier care. Second, PICK YOUR HORSES FEET OUT THOROUGHLY EVERY DAY! Third, try to keep the area around feeders and water troughs as dry as possible, and remove manure from these areas. If this is not possible, using a tooth brush rub strong iodine (7%) into your horse's soles and frog several times a week after you clean out the feet. Following these three simple rules may save you and your horse a major aggravation. Again, this problem is especially prevalent in older, less active horses, so don't forget about the feet of the retirees, even though they are no longer performance horses. This cute foal picture is here to remind you that OCD is a developmental orthopedice disease. In other words, it develops as a foal grows, although it may not manifest itself clinically until later in life when joints are subjected to the rigors of training and controlled exercise. When we consider the prognosis of various OCD lesions, then, there is one common sense rule to keep in mind: foals that develop significant lameness early in life due to OCD are likely to have more severe lesions than animals that do not show any clinical signs until they are older and in training. Regardless of the anatomic location, the larger and deeper the OCD lesion is in a given animal, the less likely it is that surgical treatment will be successful. In general, the degree of lameness and age at onset correlate with the severity of the lesion. Consider our mare Classy, a five year old just completing 60 days of fairly rigorous training and only demonstrating a grade 1 lameness and mild joint swelling. Even before examining her radiographs, one can be hopeful that her prognosis for full function would be favorable. And this is in fact the case. 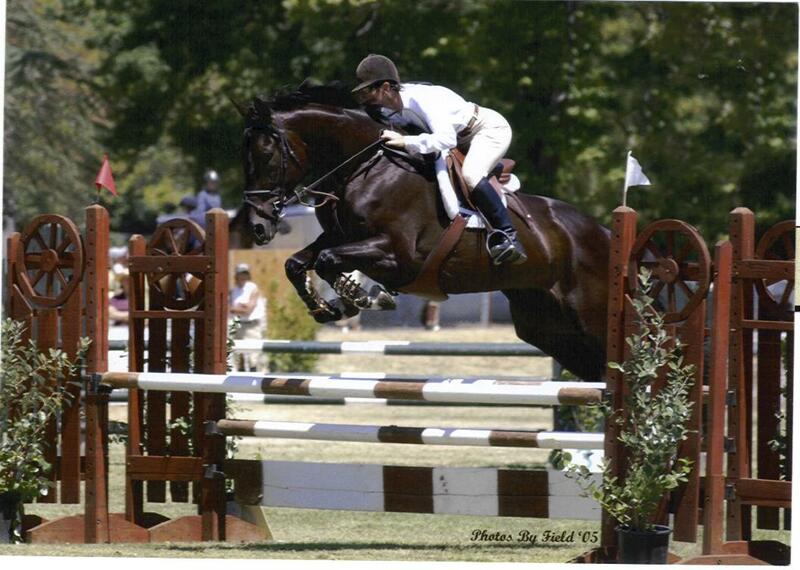 Classy has an excellent prognosis for a full athletic career following surgical debridement of her stifle lesions. On the other hand, a 6 month old weanling with grade 3 lameness and severe swelling of the stifle joint undoubtedly has a more conservative prognosis for an athletic career, even with appropriate treatment. OCD can occur in any joint in the body. The most commonly affected joints are the stifle, hock and fetlock, and less commonly the shoulder and cervical spine (neck). Within each of these joints there are several locations where lesions can occur. 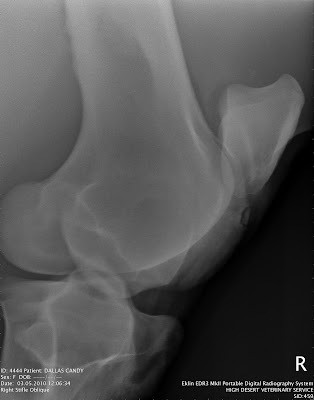 In addition, lesions may occur as mineralized cartilage fragments that have separated from the underlying bone (see Classy's x-ray's for a beautiful example) or they may appear as cyst-like lesions, where the cartilage lining the bone is still intact, but is no longer attached in one region, with fluid and tissue debris filling the area between the detached cartilage and underlying bone. Remember our jump painting analogy? The detached lesions are like paint chips, leaving the wood of the jump exposed, the cyst-like lesions are like bubbles in the paint, detached from the wood, but with the paint surface still intact. The prognosis for full athletic function for OCD of the lateral trochlear ridge in the stifle and most locations in the hock is excellent in the majority of cases, particularly when lameness is not severe, and does not become apparent until the horse enters training. OCD of the fetlock is often treated successfully, but caries a more conservative prognosis in general than lesions of the hock or stifle. OCD of the shoulder and cervical spine in general carry a guarded prognosis. There are certain anatomic locations where OCD lesions may be detected radiographically in a sound horse during a pre-purchase examination, for example, and be considered clinically insignificant, depending on their severity, and the horse's level of performance. While surgical debridement (scraping the lesion just as you would scrape the paint on your jumps before correctly applying fresh paint) remains the gold standard for treatment of OCD, there are many emerging treatments under investigation which may alter our approach to this complex disease. Intra-articular stem cell therapy is one of the most promising of these. And still, many foals and weanlings with early diagnosis of less severe forms of OCD respond well to simple rest and careful rehabilatation with intra-articular chondoprotective therapy, allowing mother nature to do her own magic in healing lesions. I've barely scratched the surface of the subject of OCD in these past few posts, but hopefully you will take away the message that in most horses this diagnosis does not mean the end of an athletic career. I'm off to dinner after a long, cold day of work in windy, 45 degree rain spitting Reno today.